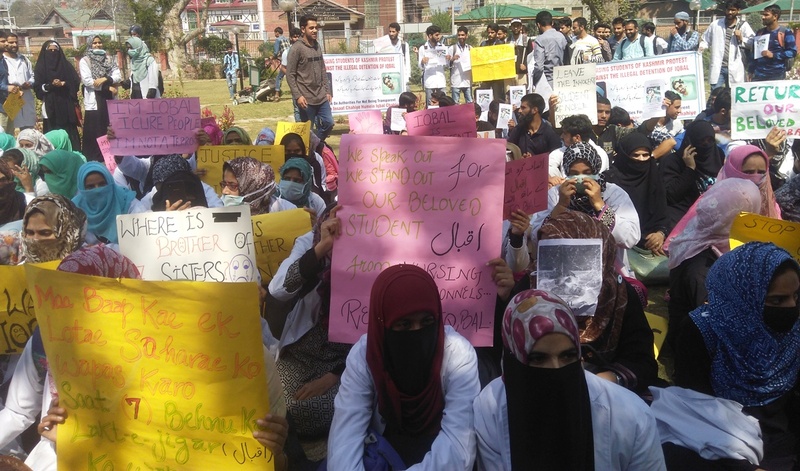 Paramedical students on Tuesday staged a protest in Srinagar to demand the release of their classmate Muhammad Iqbal who was detained by police on Srinagar-Jammu highway on September 13. The students, holding placards reading ‘Release Iqbal’, ‘Iqbal is innocent’, ‘Where is the brother of 7 sisters’, assembled at press enclave here and chanted slogans in favour of Iqbal, a resident of central Kashmir’s Budgam district. “Iqbal had gone to Jammu for medical purposes as his father is suffering from cancer. He has seven sisters, he can’t do this. We know him; the allegations against him are totally baseless,” Ishrat, one of the students said. The protesting students appealed the governor to immediately release Iqbal.